I don’t do a lot of cooking. In fact, I’m not a very good cook. But I like to entertain, and I want to spend time with my guests, not with my kitchen appliances. So, I’ve become very good at arranging food attractively on platters! Here’s some party pleasers that require assembly but little to no cooking. The first, is a big cheese appetizer platter. This is great to set out on the coffee table and let people graze all evening. Choose 3 to 5 cheeses depending on the size of your party. 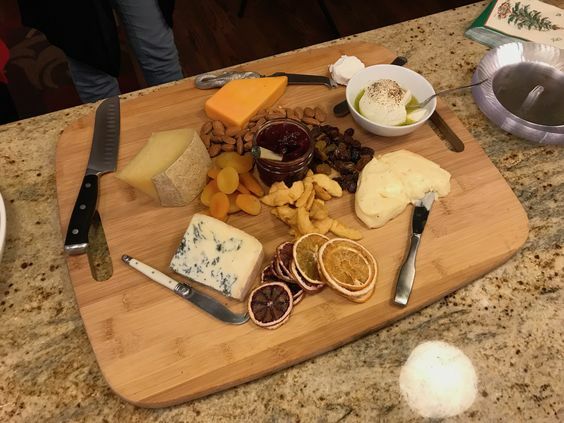 Pictured from top left: A local hard cheese from Pleasant Ridge Reserve, a nice sharp aged cheddar, (in the bowl) sliced buffalo mozzarella with pepper and olive oil, a mild creamy brie, and a domestic bleu. Sprinkled on the cutting board, dried fried (apricots, raisins, and apples), and roasted almonds. I also add a preserve like black or blueberry because it’s so yummy with the brie on crackers. Finally, I add grapes or, in this case, dried orange peel. I always have 2 to three kinds of crackers: a plain water cracker, a rice or gluten free option, and a multigrain choice. 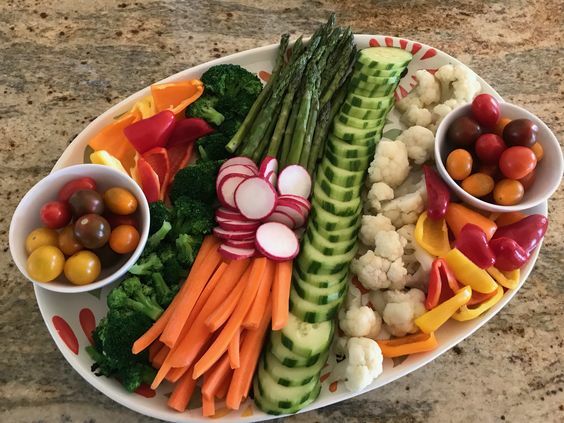 I love crudité platters, but there’s more to it than dumping raw veggies on a plate. With so many folks on vegetarian or vegan diets, a bountiful choice of veggies is always welcome. Arrangement is key. 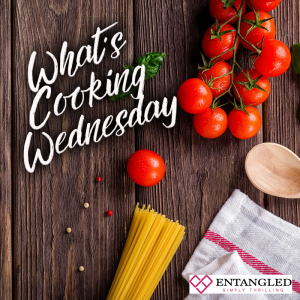 Lots of color, of course, but if you plan on adding green beans, asparagus, cauliflower, or broccoli, you must blanch them in salted water for 2 minutes, then drain well and let dry before you place them on the platter. Don’t buy veggie dips. They aren’t very good and making them is so easy. Good old fashioned Green Goddess is my favorite. 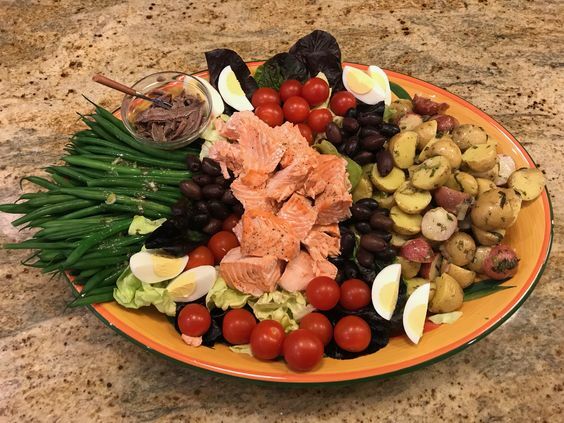 For the main event, I like to put together a Nicoise Platter. The Nicoise Platter is like a deconstructed Nicoise Salad. Ian Garten has a great (and very involved) recipe for putting together, but I have simplified to make things quite a bit easier. The French potatoes are the most work: 1 small bag of new potatoes. Boil in salted water 15 minutes, drain, allow to dry five minutes, cut in half and toss with your favorite vinaigrette, and fresh herbs (1 T chopped flat leaf parsley, 1 T chopped fresh dill, 1 T chopped fresh basil). Boil green beans in heavily salted water for 2-3 minutes, drain and dry. Assemble: Line the platter bottom with arugula or watercress or spring greens (save room in the center for your fish), spoon the potatoes on one end, the green beans on the other, arrange a pint of cherry tomatoes, 2-3 hard boiled eggs quartered (I buy them boiled and peels in a bag in the eggs section), and nestle some drained pitted Kalamata olives on the sides. OPTIONAL ADDITIONS: small balls of mozzarella cheese, flat anchovy filets, green olives, marinated artichoke hearts. The fish finishes it off. For Salmon: 2 to 3 narrow salmon filets, gently cooked, allowed to cool a bit, skin removed and broken into pieces. Tuna: 2 Nice thick tuna steaks, quick seared on the outside, rare on the inside, let cool a bit, and slice. Check out Jennifer’s new release Saving the Scot, out now! But just when Louisa thinks her plan is going to give her the acting career she wants and a Highlander to boot…Ian discovers her secret.